The Ohio House of Representatives Criminal Justice Committee listens to Gallia law enforcement. 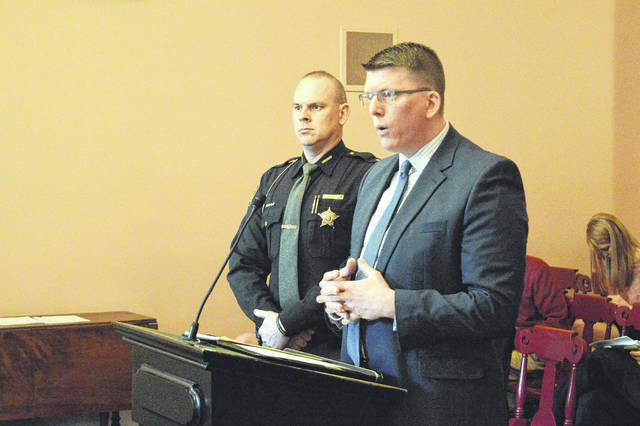 Gallia Sheriff Matt Champlin and Gallia Prosecutor Jason Holdren make a case for an increase in Ohio’s penalties for the violation of gross abuse of a corpse law. 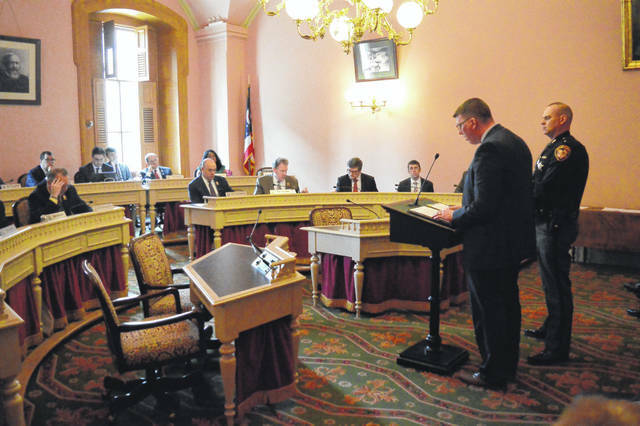 COLUMBUS — Gallia Prosecutor Jason Holdren and Gallia Sheriff Matt Champlin presented before the Ohio House of Representatives Criminal Justice Committee Thursday morning to make a case for an increase in penalties for crimes violating gross abuse of a corpse law. State Representative Ryan Smith (R-Bidwell) of the 93rd District was present in the audience for the presentation as well as Ohio Prosecuting Attorneys Association Executive Director Louis Tobin and Assistant Director Steve Hall. Champlin and Holdren provided testimony for their support of House Bill 161 which would change gross abuse of a corpse crimes from fifth-degree felonies into third-degree felonies in Ohio. Holdren referenced drug courts in both the Gallia Court of Common Pleas and the Gallipolis Municipal Court and what he and Champlin felt were successes in helping others get treatment. Holdren cited a rapid response team utilized by the sheriff’s office to push options for individuals who have overdosed to receive treatment. In the last two years, Gallia law enforcement has put over 120 individuals into community-based corrections facilities to avoid prison. Gallia has prosecuted three abuse of a corpse cases while Holdren and Champlin have been in office. All involved the discarding of a body following reported overdose situations. Of those, seven convictions were found against seven individuals violating Ohio’s gross abuse of a corpse law. Two separate investigations revolving around the deaths of Terry Rothgeb and Brian Scott Caldwell, both of Gallipolis, revealed that witnesses attempted to clean crime scenes and place bodies in vehicles before abandoning them in wooded sections of Gallia County. Rothgeb reportedly died in early 2017 and Caldwell in the summer of 2018. Richard Hurt of Gallipolis confessed to the disposal of Berry’s remains and their dismemberment in February 2017 in the Gallia Court of Common Pleas. Holdren said that Berry was first reported missing July 19, 2016. On July 31, 2016, she was discovered cut in 12 separate pieces, reportedly with a reciprocating saw. Hurt was convicted of the fifth-degree felony of gross abuse of a corpse and the third-degree felony of tampering with evidence. He was sentenced to 48 months in an Ohio facility. He was later sentenced in West Virginia to a minimum of one year in a state facility and no more than five years for the illegal concealment of a deceased human body. Berry’s autopsy reports deemed the reason of her death inconclusive. Holdren lauded the efforts of Smith for bringing House Bill 161 forward and his support to turn gross abuse of a corpse offenses from fifth-degree felonies to third-degree felonies.